This year's Fall Team Championship drew six highly competitive teams, all of which were rated over 1700. The top seeded "Underdogs" were closely followed by "No Draws Accepted" and "Fischer Cats", each approaching 1800 average. Underdogs led by NM Ian Harris and No Draws Accepted captained by CCFC Owner Melvin Patrick faced off early in the second round in a match that ended in a 3.5/0.5 sweep by No Draws. With draws between the other teams, No Draws Accepted were already in the lead by a full point after just two rounds! Fischer Cats (left) vs. No Draws Accepted (right) was a key third round match. However, in such a competitive event any team can defeat any other team and the players were just warming up. 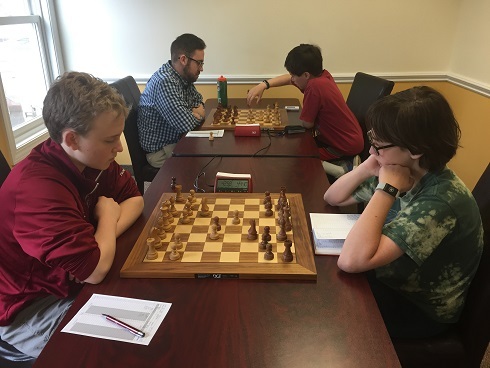 No Draws Accepted drew their third round match with Fischer Cats, who were packing a powerful combo of experts Hanon Russell and Joseph Bihlmeyer on their top boards. Meanwhile, the Underdogs began an unlikely comeback by winning their round three match, setting up a dramatic final round finish. No Draws Accepted maintained a half point lead with 2.5/3 match points and were set to face the lowest rated team of the tournament, "Positional Trumps". 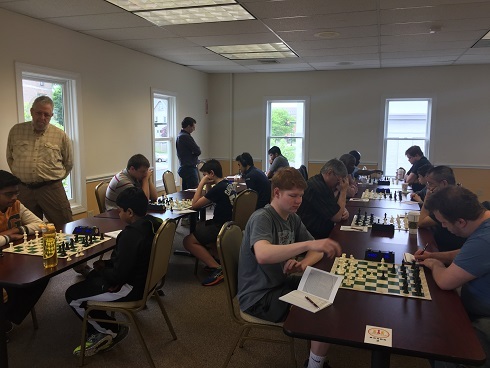 The Underdogs had narrowed the gap with 2/3, but needed to win against the very strong Fischer Cats, AND needed to win by a 3.5-0.5 margin in the event that No Draws were held to a draw, just to be able to challenge them in a tiebreak. Daryl Lavin and Aurelius Mlynar (right) scored key final round victories for the Underdogs! No Draws Accepted had their fate in their own hands, but Positional Trumps had other plans and came out swinging. After four incredible fighting games, the real underdogs of the event Positional Trumps, were victorious against No Draws Accepted, winning their match 2.5/1.5. This result mean that the team "Underdogs" could win the tournament with a match victory against Fischer Cats. 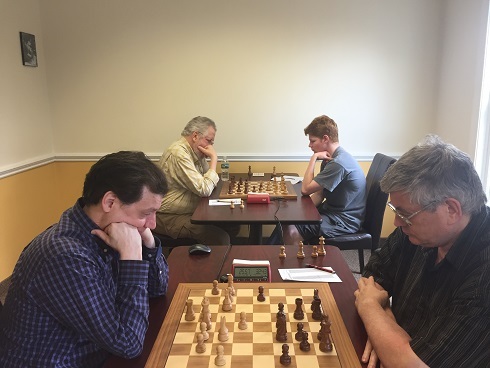 With two wins on board 3 & 4 it all came down to the last game of the entire tournament between NM Ian Harris and Expert Hanon Russell. In a tricky knight endgame, it was Harris who got the upper hand and won. Thus "Underdogs" (with Ian Harris, Scott Buono, Aurelius Mlynar and Daryl Lavin) leapfrogged into the first place with a final score of 3/4! 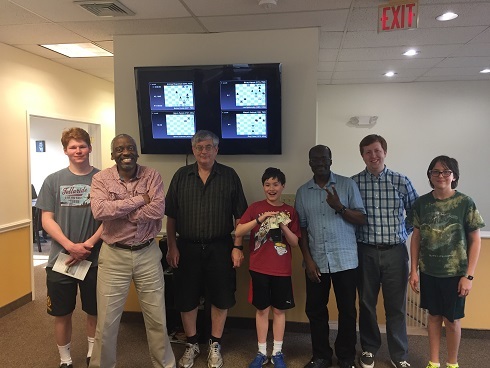 No Draws Accepted (with Andrew Rogozinski, Leo Bykhovsky, Melvin Patrick and Guy Colas) took second place honors with 2.5/4 match points. In addition to the dramatic team results, there were also several impressive individual performances. Joseph Bihlmeyer and Daryl Lavin finished with 3.5/4 each to lead the crosstable. Daniel Cooper picked up over 50 points to reach a new all time peak rating, simultaneously going over 2000. Andrew Rogozinski won three games to gain over 70 points, also to a new peak rating, and is now within 3 points of becoming an expert! Congratulations to all and thank you to everyone that came out to participate.